Summary: Mammē Mary has a special wooden treasure box, made for her by her son, Jesus. As she opens the box to share the treasures with her granddaughter, Sarah, her memory is flooded with the treasured moments, people, and events that surrounded her when she gave birth to her first born son. Slowly and carefully she allows Sarah to handle each item in the box as she retells the story of Jesus’ birth. Literary elements at work in the story: A beautifully illustrated book that tells the story of Jesus’ birth using artifacts and symbols that have deep theological meaning. Based on the biblical story, this book does take some “safe liberties” in describing the events surrounding the coming of the Messiah. How does the perspective on gender/race/culture/economics/ability make a difference to the story? This is Mary’s story told to her granddaughter as only a grandmother could tell. The artwork is beautifully done to portray the beauty of the story although the characters in the book more American than Middle Eastern. That being said, the book is a beautiful retelling of the scriptural story. What did Mary actually keep from the birth of Jesus? We have no way of knowing. Theological Conversation Partners: The dedication page of this book sets the stage with these words: “Every mother has a Treasure Box of bonnets, blankets, trinkets, and toys, if not hidden in a closet or an attic, then tucked away in a corner of her heart. Mary hid these things in her heart. Luke 2:19.” Each year during the Advent/Christmas season, we allow ourselves to imagine and wonder about the events that took place long ago in Bethlehem. We set up nativity scenes in our churches and homes, stage Christmas Pageants, and hang Chrismons to help us bring to the surface the treasures we have stored in our hearts about this miraculous gift of love from God. Mementos have long been a source for remembering and telling our story, serving as visual reminders that stir our subconscious and elicit a response of gratitude and praise to God. Whenever we see a picture or symbol of the manger, we bow in humbleness and thankfulness for the gift of salvation brought to us through Jesus Christ, our Messiah. The story of the birth of Jesus is one that has been told and retold throughout the centuries. Told in countless ways by multitudes of people, it is God’s story of love that is timeless and precious to our faith. What treasures or mementos do you have from your birth? How do seeing and touching this items help you retell the story of who you are? What item from Mary’s treasure box do you think is the most special? Why? How do we treasure things in our heart? What things do you treasure most in your heart? How can you share what you treasure about Jesus with others? How could you use symbols or mementos to tell someone the story of God’s love shown through Jesus? 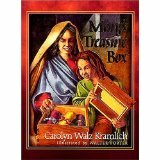 Mary’s Treasure Box by Storypath is licensed under a Creative Commons Attribution-NonCommercial 4.0 International License. One of my all time favorites! Thanks Krista!